Was it just a couple of weeks ago that I declared my fear of yeast? I was kind of just kidding, of course. I actually work with yeast fairly often, but it’s definitely not an ingredient that is in my comfort zone. When it works the way it’s supposed to… properly bubbling when mixed with warm water, and giving rise to dough, then I’m completely okay with it! 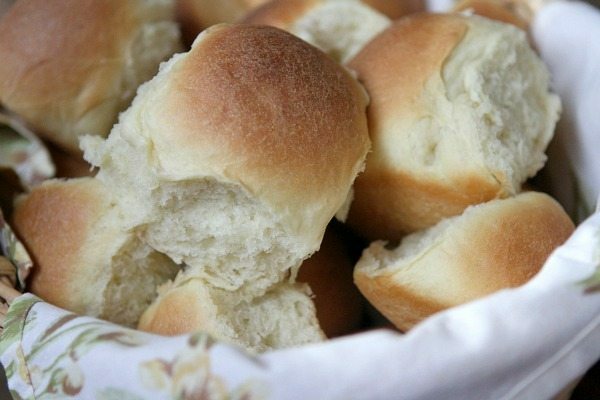 This recipe for soft yeast rolls is one of the easiest I’ve ever tried. 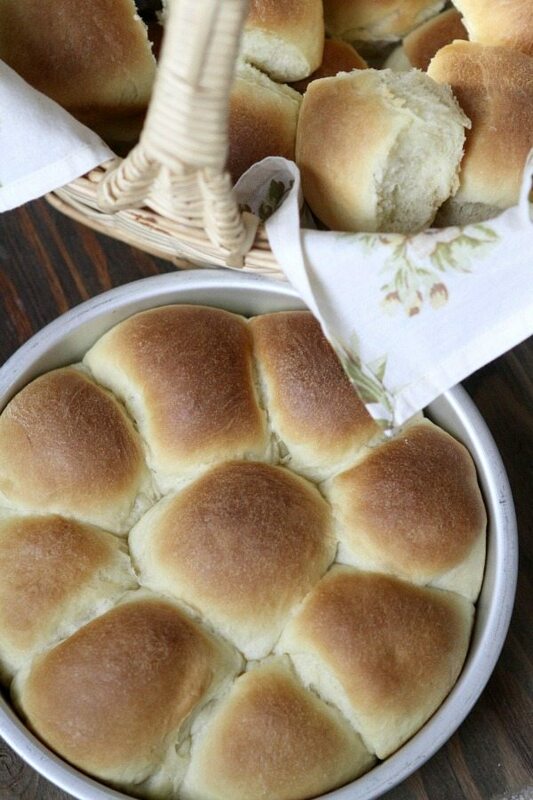 The rolls truly do come out of the oven so pull-apart tender and soft. They’re made in three round cake pans (you’ll end up with 27 rolls in the end). And they’re perfectly okay to make early in the day (or the day prior to serving). Just wrap the whole bunch in foil and warm them in the oven before serving. I wrapped one of these and froze it for later- I just kept it in one big round chunk, and I’ll pull it apart when I decide to defrost it. 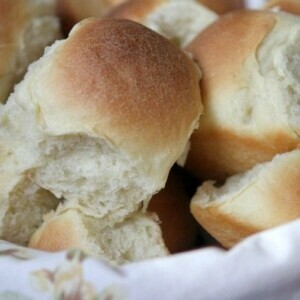 My guests had a tough time keeping their hands off of these rolls. Their pillowy soft texture is addicting! In a small bowl, dissolve the yeast and 1 teaspoon sugar in warm water; let stand for 5 minutes. The yeast will begin to bubble. In a large bowl, use a rubber spatula to cream together the butter, shortening, salt and remaining 2/3 cup sugar. Stir in the boiling water; let cool to 110° to 115°F. Add the yeast mixture and eggs; mix well. Stir in enough flour to form a soft dough (you might not use all 7+ cups). Turn onto a floured surface; knead until smooth and elastic, about 6 to 8 minutes. Place in a greased bowl, turning once to grease the top of the dough. Cover loosely with a clean dishtowel and let rise in a warm place until doubled, about 1 hour. Punch the dough down. Turn onto a lightly floured surface; divide into thirds. Divide each portion into nine pieces; shape into balls. Place in three greased 9-inch round baking pans. Cover and let rise until doubled, about 30 minutes. Bake at 350°F. for 20 to 25 minutes or until golden brown. Cool in pans on wire racks.